Main image created by Peter from Sedaris’s, Alexie’s, and Saunders’s cover images on the Hachette Books website. 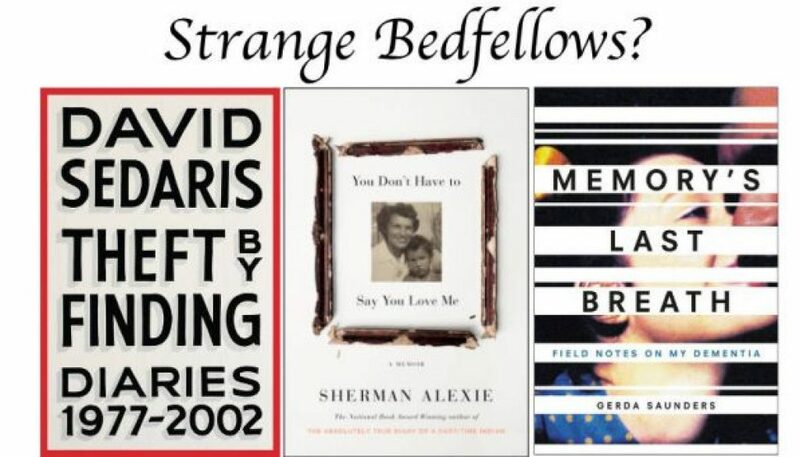 I’m so honored that MEMORY’S LAST BREATH made it onto a list that includes David Sedaris with THEFT BY FINDING: DIARIES (1977-2002) and Sherman Alexie with YOU DON’T HAVE TO SAY YOU LOVE ME: A MEMOIR . By coincidence, I heard David Sedaris being interviewed about THEFT on the program q (KUER 90.1 ) tonight. Click here to see all “10 Buzzworthy Books from Memoirists and Essayists” in Kirkus Reviews.